North Yorkshire is a large, scenic county bustling with campers available to rent for your holiday. You will find campers located at bases around the county including Middlesbrough, York and Harrogate. 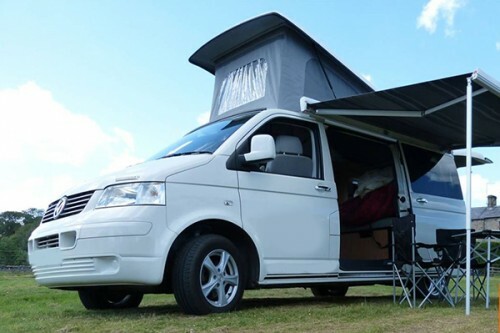 The campervan owners are seeking to hire their vws to people whether they’re visiting the county or from it and cater for locations including Skipton, Selby and Ripon. I am VW T5 Campervan, hire me today! VW T5 campervan, with seating, beds and equipment for two adults and two children. It is equipped with cooker, fridge, sink and toilet, as well as wind-out awning, outdoor furniture, 240V heater, maps and games. Britstops guide, silver screens, ramps, hook-up lead & gas are all included too, as are an optional bike rack and "AirBeam" drive-away awning. All hirers take away a hot drinks hamper to get the holiday started... Yorkshire teabags, coffee, sugar, milk and biscuits included! Our classic 3 1/2 berth VW camper is perfect if you are looking for an excuse to get out and see more of the British Isles. A VW T5 LWB conversion with 4 sleeping areas and two captains chairs in the front. Solar panels and a 200aH lithium battery (LiFE PO), fridge, stove, grill and 240 mains sockets (from the inverter). VW T5 van that comes with all you will need for a superb camping experience. With a state of the art interior it's a home away from home.